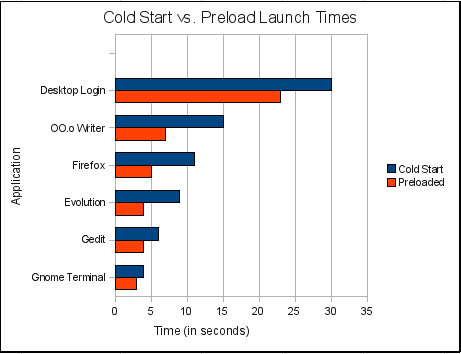 I would like to know what are the drawbacks of using preload? If there would be no downside, preload would be enabled by default, so I guess there are some. Okay you need a bit more RAM, but most people have by far more RAM then Ubuntu needs - so what are the downsides of using preload? Simply put, Preload isn't for everyone. It is great if you open applications or libraries a lot. It is harmful if you load applications or libraries only occasionally. I will use two examples from my actual usage (and yes I use preload). First, Google Chrome. Now a browser is opened only once per boot, maybe twice (for me, I am a web developer). Chrome and its related libraries stay in memory because I am always using it. Even when I close all the chrome windows it's still in the background doing its thing. Thus all the ram dedicated to holding a preload copy of Chrome is a total and utter waste. It's never (or rarely) unloaded. For the average user this is true for a great number of applications. A Office user will almost always have their email app open. So the small savings in startup time is completely wasted because they only open their email app once a day, and leave it open. The Second example is rake. As a ruby developer that believes in testing I run rake a TON. rake runs, executes for a couple of seconds - minutes then exits. Preload helps me speed up my daily work because it loads rake and its needed libraries (which can be very extensive) ahead of time. So there are a lot of starts and stops to the running of rake. The extra ram used to speed up the 400 or 500 launches of rake over the span of a few hours is totally worth it. So the reason it's not enabled by default is because its ability to actually improve performance is based largely on how you use your system. For some people it will be a negative and for others a positive. Lastly, having preload on, even if you're not using it, consumes ram. So if you're not launching applications frequently, you could actually make your entire system fractionally slower by not having that ram available for other types of caching. Remember, even if you have 32 Gigs of ram Linux will try to use as much of it as it can to cache data to make your interaction faster. By using preload you reduce that free memory some. Even if it is just a little tiny bit, the 2 seconds you saved launching chrome 1 time could cost you 60 seconds over the month it stays running. Hi all, I want to know, Is it a myth? Does [preload] really improve my performance? What are drawbacks of using it? I have a laptop with this specification (Core i5 CPU, 4GB RAM, 128GB SSD Hard). Thank you so much. The basic downside then is that preload is "using" additional memory without providing a tangible benefit. Don’t expect to see a drastic change in performance right away. Also, if you’re just opening/closing applications repetitively, your computer will store those files in cache anyway (this is called a “warm” load), so you won’t see any difference in speed there. You will, however, see a speed improvement if, for example, you use a program intermittently; these programs will start up faster than without Preload. Now that being said, it seems that preload is a great utility, and it might be. I think that the reason its not preloaded with the OS, is because the user has to know exactly what there doing, and have enough experience to be able to use it, and the system has to have enough RAM. On a more technical aspect, preload works by moving data from the hard disk to RAM, which makes most hard disk to go to sleep mode if not used, and then have to spin back up when needed. So spinning up/down the drive, would cause the Load/Unload Cycle count, and the Power-On time count rise, and that will shorten the life of the drive. We designed and implemented preload, a Markov-based adaptive prefetching scheme that works on application-level predictions. Moreover, preload is implemented in the userspace and does not change the application run-time environment in any sense. This is the ﬁrst work experimenting with ﬁle-system prefetching at this level as far as we know. Our experimental results show promising improvements on application start-up time compared to cold caches, and a decent hit rate compared to a na¨ıve prediction algorithm. However, being in user-space introduces major obstacles into making preload a competitive solution to the startup-time problem. In particular, not having full information about applications’ I/O requests, and lack of strong communication channels with the page-cache subsystem degrades preload’s eﬀectiveness drastically, especially under tight memory conditions. Another inherent problem with the preload design is high variance and low prediction conﬁdence caused by the relatively loose correlation of application start-ups. While we successfully build a model to track application correlations, the fact that application launches are very rare events compared to the timescale that computers work on, an application-level prefetching scheme is condemned to consume huge prefetching memory over practically inﬁnite periods of time. This memory can be used to improve short-term cache behavior. 2Source:Preload - An Adaptive Prefetching Daemon by Behdad Esfahbod - A thesis submitted in conformity with the requirements for the degree of Master of Science - Graduate Department of Computer Science - University of Toronto Copyright (c) 2006 by Behdad Esfahbod. Increased performance opening applications by the user. I have used it for years on my systems as well as "read-ahead" and have no issues. The bug page for preload doesn't suggest any drawbacks either. Preload monitors applications that users run, and by analysing this data, predicts what applications users might run, and fetches those binaries and their dependencies into memory for faster startup times. It does increase the boot time slightly however the speed decrease fetching time of applications far exceeds this little issue. Not the answer you're looking for? Browse other questions tagged ram cache preload or ask your own question. How to clean “Preload” cache? How to check memory type and speed? How to allocate more ram? Use excess RAM as cache for Samba? Why does a newer version of an operating system require more memory?